“But when he who had set me apart before I was born, and who called me by his grace, was pleased to reveal his Son to me, in order that I might preach him among the Gentiles, I did not immediately consult with anyone; nor did I go up to Jerusalem to those who were apostles before me, but I went away into Arabia, and returned again to Damascus” (Galatians 1:15-17 ESV). In his effort to counter the works-based salvation message promoted by those who had worked their way into the first-century churches of Galatia, Paul the Apostle offered a biological sketch to justify the source of his message. But unlike most biographies, Paul’s story began before he was born, for the passage quoted above tells us Paul received his commission to proclaim the message of salvation by grace through faith prior to his birth. “The idea is, ‘who set me apart, devoted me to a special purpose from before my birth, and before I had any impulses or principles of my own.’ Passages from the Old Testament sustain this usage (Judges 16:17; Isaiah 44:21, 24, 49:1, 5). This idea is also seen in those instances where a child’s destiny is clearly fixed by God before birth as was Samson’s (Judges 16:17), and John the Baptist’s (Luke 1:15). Paul followed by saying, “I immediately prepared to do this work without asking for advice or help from anyone” (ERV). In other words, Paul did not attempt to coordinate his message with others, nor did he seek direction from the leaders of the first-century church. 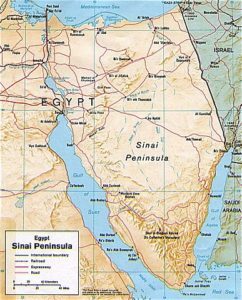 Instead, he departed for the desert regions of Arabia, a location that is roughly synonymous with the area around the Sinai Peninsula today. Although this portion of Paul’s life is not recorded in the New Testament book of Acts, it may have occurred during the intervening period between Acts 9:22-23. (2) So this independent “chain of custody” established an important sequence of events for those reading this letter. First, God made a sovereign decision to assign Paul with the responsibility of representing Him. Paul then received the message of the gospel directly from Jesus (Galatians 1:11-12) just as His other apostles did. (1) Kenneth S. Wuest, Word Studies in the Greek New Testament (Galatians 1:15-16) Copyright © 1942-55 by Wm. B. Eerdmans Publishing Co.
(2) Ryrie, Charles Caldwell Ryrie Study Notes [Galatians 3:17] © 1986, 1995 by The Moody Bible Institute of Chicago. Database © 2004 WORDsearch Corp.